Only Three Days in Seattle? 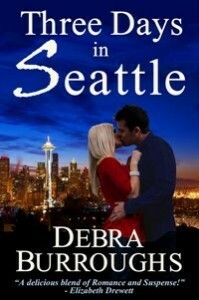 Debra Burroughs' book titled, Three Days in Seattle, was an engaging read. I had previously read one of her titles, She Had No Choice and thought it to be an emotionally-gripping read so I didn't hesitate to purchase another of her titles. In Three Days in Seattle, Kate is summoned to Seattle by Suki (her sister's roommate) because her sister has, presumably, gone missing. Through a calamity of mishaps, Kate finally arrives in Seattle about 36 hours later but not before striking up a conversation with Ryan, a fellow passenger sitting across the aisle from her on the plane. The two become separated when disembarking the airplane and Kate heads directly to the police station. Imagine her surprise when she leaves with two detectives, only to run into Ryan, a real estate agent meeting one of the detectives. Even more surprising is the fact that Ryan used to be a law enforcement officer. I enjoyed the two lead characters and thought the author did a commendable job in telling their story, how they met unexpectedly and, ultimately, fell in love. Ryan and Kate seemed to be perfect for each other and, when push came to shove, Ryan was definitely Kate's hero - even breaking orders from law enforcement officials because he just had to get to Kate, knowing she was in danger, that her life could be taken within moments. For me, Three Days in Seattle is, essentially, a romantic tale. As for suspense, I wondered who Suki really was and there were different hints provided about her and the mysterious guy Kate kept seeing wherever she went. However, even when I realized what the guy had planned for Kate, it still didn't trigger a sense of panic in me. By the time I began reading the last quarter of the book, things changed; I really began wondering how everything was going to resolve itself. Without a doubt, it was touch and go for a while as I wondered if there would be a happy ending for Ryan and Kate and if Whitney, Kate's sister, would live through her ordeal. Debra Burroughs caught my attention, once again, in a different type of story than She Had No Choice. It was engaging and I look forward to getting to know other characters she has created in other titles she has published. You can learn more about Three Days in Seattle by clicking the book cover which will take you to its page on Amazon. If would like to read the review I did for She Had No Choice, a Latin version of The Color Purple, please click here.